Our next installment of special interview episodes, comes from the awesome mind of author, Michael Witwer! Michael is the author of Empire of Imagination: Gary Gygax and the Birth of Dungeons & Dragons, and the co-author of the book we are talking about today, D&D Art & Arcana! If you listen to the show, you know that Gabe is a BIG Dungeons and Dragons fan, and even holds a weekly game!! Because of this, when we heard about the Art & Arcana book, we knew we had to get Michael on the show to talk about this awesome book!! Michael tells us about his love for Dungeons & Dragons, as well as how he came to be a fan of the game! 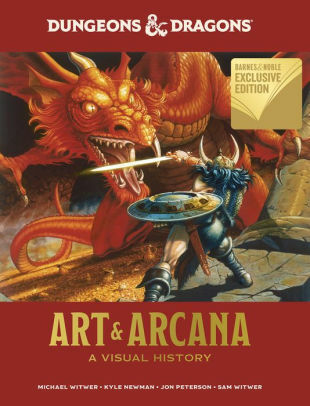 D&D Art & Arcana is “An illustrated guide to the history and evolution of the beloved role-playing game told through the paintings, sketches, illustrations, and visual ephemera behind its creation, growth, and continued popularity.” Can you imagine having to find the 14 and 15 year olds who first created these awesome illustrations that D&D fans have come to know!? It’s a very cool journey, that they didn’t even know they were a part of, until this book came along! Click on the link above to order the book, but you can also order this special edition!! !